“It’s not change. It’s a f*cking revolution,” said a media analyst in the brilliant New York Times documentary Page One. He was referring of course to how the online world has ripped up the traditional business model of newspapers replacing highly profitable print advertising and classifieds ads (the so-called “rivers of gold”) with cheap, interactive and intuitive online offerings. Fairfax journalist Pam Williams did a brilliant job telling this story in her book “Killing Fairfax” – reviewed here – but is by no means the whole story. The wheels of change continue to spin and at an even faster rate. Two of the hottest and most provocative concepts becoming entrenched in the new age of publishing are “native advertising” and “corporate journalism”. 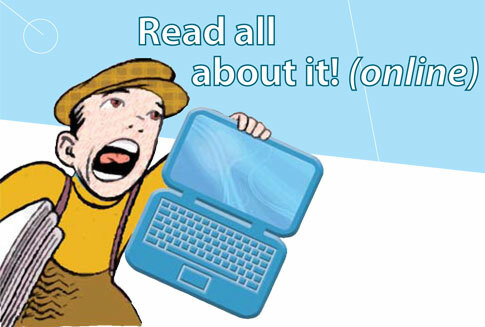 “Corporate journalism” – content produced by an in-house editorial team focusing on issues that matter to the corporation and its stakeholders – was in the spotlight following the launch of ANZ Bank’s new website BlueNotes in April, billed as “the first corporate digital publication for news, opinion and insight of its type in the Asia-Pacific region”. The launch of BlueNotes sparked healthy debate on Twitter kicked off by Australian Financial Review columnist Christopher Joye who wrote that the ANZ site was likely to be “part bank brand-building, marketing and spin, opening up a new channel through which to project ANZ’s voice; and part bona-fide research and insight that will be of value to ANZ’s constituencies”. What BlueNotes was unlikely to be, Joye wrote, was independent journalism of the sort produced by Fairfax and other traditional independent media. Nor would it be an “intellectual free-for-all that interrogates issues and disseminates opinion on topics germane to ANZ’s customers, but which can also conflict with ANZ’s profit motive”. I tweeted Joye’s article and said that I agreed with him that BlueNotes is “not really journalism” to which former AFR senior journalist Andrew Cornell, the managing editor of BlueNotes, responded that it then begged the question: “What really is journalism?” and…was it restricted to “no-for-profits?” (A cheeky remark surely alluding to the fact that once-powerful media empires can’t seem to make a buck out of journalism anymore). Cornell is a firm believer that corporate journalism – of the kind produced by his team – is the future of business journalism. It was a remark he repeated often in his last few weeks at the AFR. Amanda Gome, a former colleague of mine at Private Media and Fairfax, and now head of strategic content & digital media at ANZ, tweeted that BlueNotes was “new journalism” or “corporate publishing” – (and in another tweet, that it was definitely not native advertising). Paul Edwards head of corporate communications at ANZ said if the site “started doing ads” then it would “fail”. Rather, he said, it aims to “engage thought leaders not sell stuff”. On reflection, I agree with Christopher Joye that there is merit in what ANZ is doing with BlueNotes. The views of its experienced executives, economists and commentators while slanted towards the bank’s view of the world, are insightful and important (though I would argue they are better served as part of a balanced article in the mainstream media drawing on the views of others as well). Only time will tell how many people find value in its offering, but it should find a niche among the myriad of online news and commentary sites finding an audience in Australia ranging from academic sites like The Conversation to mummy blogger uber-site Mamamia. In its defence, corporate journalism like BlueNotes does not attempt to hide the fact that is an ANZ-produced publication, focusing on issues that are of important to the bank, its shareholders and clients. But native advertising is less honest, muddying the waters between news and commercial interests and breaking down the traditional editorial division between church (editorial) and state (advertising). Farhad Manjoo, a journalist with the Washington Post wrote of the deceptive quality of native ads that while they “usually carry a tag identifying them as ‘sponsored,’ they appear alongside and share the look and feel of the search results, tweets, status updates, blog posts and other content that you don’t immediately suspect of containing paid messages”. 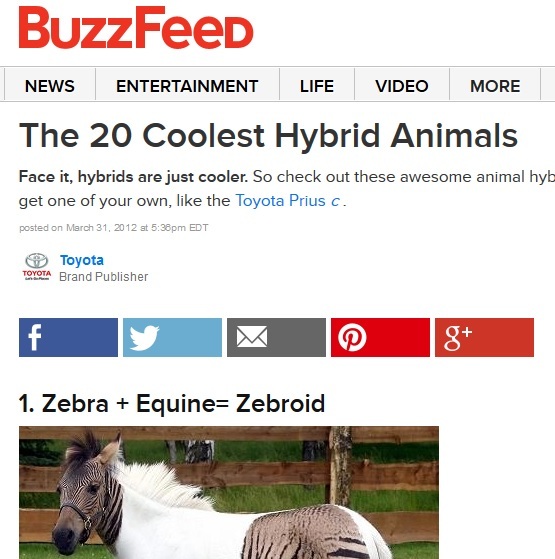 He makes the point that there is a place for native advertising provided that it is clearly branded as sponsored content (he mentioned a story paid for by Toyota about 20 coolest hybrid animals to promote its hybrid cars that ran on BuzzFeed as a good example) but is sceptical of how this will play out over time. Native ads he says, “create incentives for misbehavior by advertisers, publishers and services like Facebook—and, over the long run, the incentive structure is sure to translate into looser disclosure standards and generally trickier content”. The agenda of BlueNotes on the other hand is all in the name – unless of course you’re looking for a Miles Davis record. In 2004, soon after arriving in Australia, I took a boat from Cairns out to the Great Barrier Reef with my then girlfriend. An hour or so later, seemingly in the middle of the ocean, the boat stopped and dropped anchor next to a floating platform. We donned our wetsuits, flippers and goggles and plunged into the vast, bobbing ocean. In the back of my mind and I am certain in the back of the minds of everyone in the water that day was: Is there a shark out here? For the next hour or so we snorkled among the reef, enjoying the colourful fish that swam past and the corals waving in the currents. But try as I might, I could not get the idea out of my head, that somewhere in that enormous expanse of blue water lurked a perfectly designed grey and white torpedo shaped creature with lots of teeth, who might find a recently arrived pasty South African a tasty entree. Assurances by the tour operator that large sharks stuck to the deeper channels of water did not re-assure me. After all, what was stopping them from doing a bit of exploring out of their comfort zone on this very day? And what if someone in the water was bleeding? Or splashing about madly? In the end I was relieved when we hauled ourselves back on the boat, removed our wetsuits and tucked into the buffet spread before the engines were revved up and we headed back to Cairns harbour. Almost 10 years have passed, but I still remember the feeling of complete helplessness, floating about with nightmarish thoughts circling in my head and the constant need to come to the surface to scour the waves for the familiar dorsal fin. This week, while hunting for something to watch, I came across the movie “The Reef” on the ABC’s iview. Made in 2010, it’s about five friends who get stranded in the ocean when their boat hits the reef and capsizes. 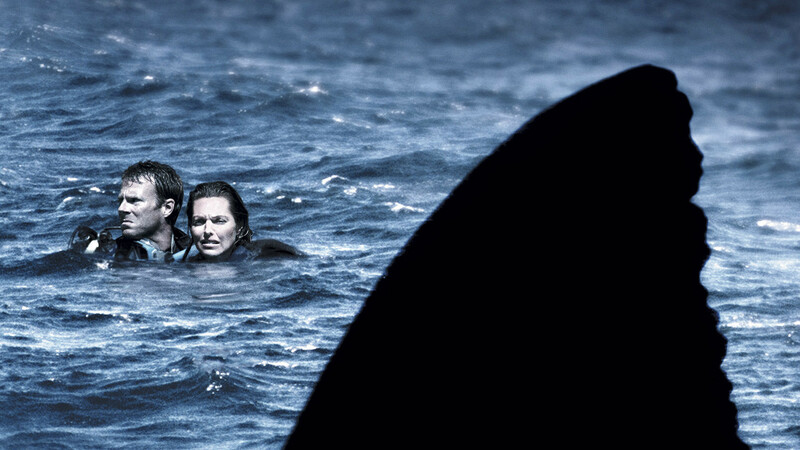 Four of the friends attempt to swim to an island in the hope of being rescued only to be stalked – and for three of them to be eaten – by an enormous great white shark. It is, in my opinion, one just three classic movies made about sharks (excluding those amazing documentaries on National Geographic and the Discovery Channel). The other two are of course Steven Spielberg’s Jaws, made in 1975 about a rogue great white shark killing swimmers in the beach side town of Amity Island and the three men (brilliantly played by Roy Scheider, Richard Dreyfuss and Richard Shaw) who set off to kill it and Open Water made in 2003 about an American couple abandoned in the middle of the ocean after a diving expedition and who become the prey for hungry sharks. Alongside them are litany of terrible, stupid and silly shark movies usually incorporating D grade special effects (the cult film “Sharknado” the pinnacle of silliness), unfathomable plotlines and wooden acting performances that provide stiff competition for the computer-generated sharks. The Reef though is one of the scariest and most suspenseful movies I have yet seen, placing the camera in the water as the four suntanned helpless heroes bob about while a huge great white shark circles silently and menacingly, waiting for its moment. This “in the water” film-making is also employed in Open Water, leaving viewers gasping and shuddering when a fin cuts across the screen. In both these films, the sharks are all very real compared with “Bruce” the mechanical shark used in Jaws, which famously broke down continuously, forcing Spielberg to use it sparingly, which in the end cleverly added to the suspense. 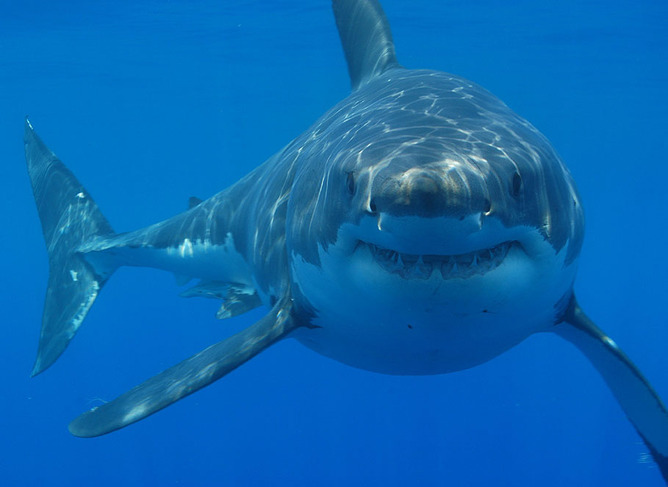 Jaws is also pure fiction – based on a best-selling novel by Peter Benchley (he is said to have got the idea from a series of famous shark attacks on the Jersey Shore in 1916) while Open Waters and The Reef purport to be based on or inspired by real events. Open Waters is based on the true story of Louisiana couple Tom and Eileen Lonergan, who disappeared off the Great Barrier Reef in 1998, after a diving company accidentally left them behind. However, that is where “true” part of the story begins and ends. 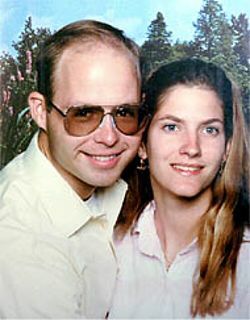 Investigations of their disappearance found no evidence they were taken by sharks. There were wild, unsubstantiated theories they either committed suicide or had hashed some kind of insurance scam, but the official Queensland police was they perished at sea. Dive equipment believed to have been worn by the couple washed up later, but without any evidence of bite marks. “There is no indication at this stage that they have been killed at sea . . . There are no bodies, the equipment found has not been shredded. It is almost impossible for them to be taken by a shark. There are not big sharks in the reef area where they were. There are white tip reef or black tip reef sharks. They are docile two-metre sharks . . . The Reef stands on more solid ground. It is based on real shark attacks that occurred off the coast of Townsville in 1983 involving trawlerman and lone survivor Ray Boundy and two others who perished. 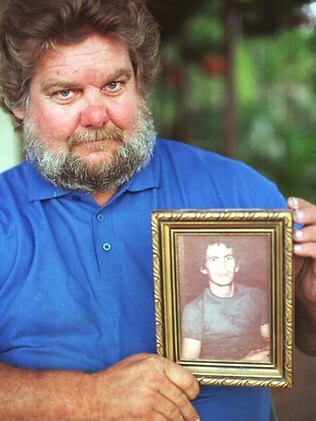 Mr Boundy told the Courier Mail in 2010, when the movie The Reef was released, that the prawn trawler he was working on capsized with himself, deckhand Dennis Murphy, 24, and cook Linda Horton, 21 on board. The date was July 25, 1983. They were left in the ocean a day and a half. 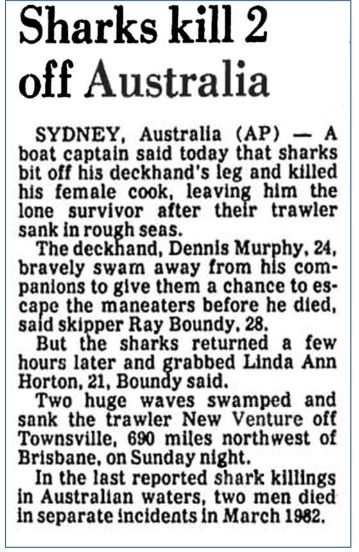 The shark or sharks that killed Denis Murphy returned later and killed Linda Horton and also attacked Ray Boundy, who was later rescued by helicopter after swimming to a nearby reef. He was treated for his shark bites in the Townsville Hospital. “I knew it was going to be one of us. And then Ms Horton was gone,” he told the paper. None of which is true. But then again, it hardly matters. It’s all about primal fear. Fear, and of course deep respect – something the Western Australian government could learn a thing or two about. 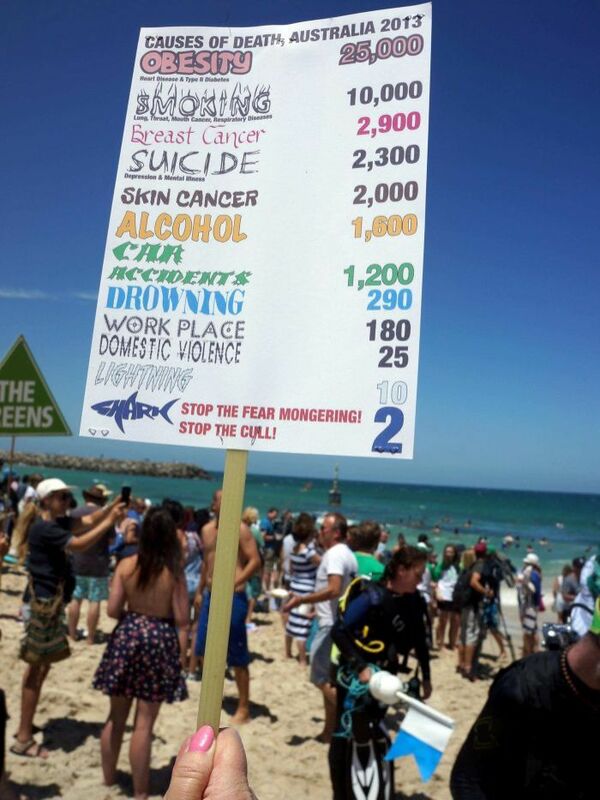 ABC’s Fact File: Protecting people from shark attacks. Have you paid too much for your iPad? Financial institution CommSec recently published an interesting global retailing index called the iPad Index. The index ranks the cost of a buying an Apple Air 16 GB wi-fi iPad in 51 different countries converted into US dollars at prevailing exchange rates, mirroring The Economist’s much more famous Big Mac index. The latest iPad Index shows Australia slipped from 4th cheapest country to purchase the popular computer tablet in September last year to 13th on the latest list – still (surprisingly) one of the cheapest places in the world to buy the gadget. The fall down the list reflects a decision by Apple to lift local pricing rather than currency fluctuations – the Australian dollar was around 94 US cents when the index was compiled, hardly changed from an exchange rate of 94.3 US cents in September last year. Malaysia at $494 is actually the cheapest place for Australians to buy an iPad, saving you around US$68 off the Australian price ($562). 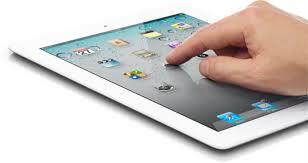 Canada and Japan both add sales taxes to their purchases, pushing their iPad prices well above $500. As the index shows, you certainly wouldn’t want to buy an iPad while visiting Brazil for this year’s Fifa World Cup while much of Europe is also a no-go zone for cheap iPad purchases, mainly because of high taxes. Alternatively, if you’re a Kiwi heading over to Australia for the Bledisloe Cup, you could save yourselves around $90 by purchasing an iPad over here. Firstly, it could be interpreted to reflect Apple’s gouging of its Australian customers at the same time as its also gouges those who purchase songs and movies on iTunes (ABC show The Checkout highlighted this recently and provided a way around it), whilst gouging the Australian Tax office by shifting all of its taxable profits offshore. If you’re not feeling the Apple love, perhaps a Samsung or Google Nexus device will do instead. Secondly, in the word’s of CommSec chief economist Craig James the index reflects why “on-line shopping sites and the power of travel are putting pressure on Australia retailers to remain competitive”. “If local pricing isn’t responsive to exchange rate changes then Aussie shoppers will increasingly look overseas to purchase imported items,” James says. Thirdly, for investors, the current index could be interpreted to mean that the Australian dollar is overvalued if you compare it with the cost of an iPad in California ($543) but undervalued if you compare it with what it costs in China ($578) where all iPads are manufactured. Fourthly, the higher price may also reflect higher Australian freight costs, tariffs and mark-ups. So it’s a useful index both for retailers who want to remain competitive and for consumers, if they’re planning a holiday in the coming months and want to upgrade their tablet. Alternatively, if you’ve got a friend visiting from Argentina or Brazil or Europe, a visit to an Australian Apple store might be a good suggestion. This month, for the first time, some cinemas in Australia started charging $20 for movie tickets. Explaining the need to push up prices, one cinema owner, Benjamin Zeccola of Palace Cinemas – the independent upmarket/arthouse chain – defended this by saying it was primarily because of the rise in the illegal downloading of movies, (plus high wages). According to research by the Intellectual Property Awareness Foundation (an organisation representing film and television companies campaigning against online content theft), more than a quarter of young Australians illegally download movies or TV shows, among the highest rate in the world. There is little doubt that illegal downloads are having a massive impact on cinema house revenues. At the same time, the cost of having a night out at the cinema has skyrocketed in recent years (as a kid in South Africa in the 1980s I paid 1 Rand for movies as part of the Ster Kinekor club – about 50 Australian cents), which partly explains why illegal downloads are so high. The other factor behind the rampant illegal downloading of movies is that the notion that you are “stealing” has never really sunk into the collective consciousness of downloaders, and may never do so. You can say it’s the same thing as riding off on someone elses bike or filling up your car with petrol and driving off without paying for it, but people that download movies illegally, probably don’t visualise it in that way because its free, easy to do and the chances of getting caught are virtually zero. In Manhattan, an adult ticket at the AMC Empire cinema is US$13 (A$14) – 35 per cent cheaper than the $20 Australians are now expected to fork out. But in London, a movie at the Odeon on Leceister Square in the heart of the West End, will set you back £15.50 – a whopping $28 in Australian dollars, or 40 per cent more expensive. But the ticket is only part of the cost. When you factor in the popcorn, drinks and snacks, you’re unlikely to see much change from a $50 note, and nothing from a $100 note if you take a family of four to the movies. Running a cinema though is an expensive business. Most cinemas are in shopping centres, which charge among the highest rents in the country. Then there’s the cost of renting the film from the distributors, staff wages, maintenance costs, utility bills and equipment and goods to pay for. 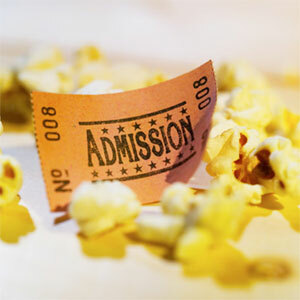 According to a 2013 article in the UK’s Independent newspaper, the cover price of a cinema ticket is consumed by film rights (40-60%), staff salaries (20%), rent (15%), utilities (5%) and other costs (10%). Add that all up and there’s no margin to speak of. Which is why you pay ludicrous prices for popcorn, drinks and snacks. According to the same article, “in order to remain competitive, a multiplex’s main source of profit actually comes from the concessions stand, rather than the box office”. Or to quote from Arrested Development – “the money is in the banana stand”. Just consider that you can buy a 375 packet of unpopped popcorn kernels – enough to make three or four jumbo sized popcorn boxes – for $1.34 at Coles, but the cheapest box of a popcorn at the cinema will set you back at least $5. Add the choc-top ice-cream and drink to your purchase and even if you use a “combo” offer you’re likely to fork out $10 to $15 more on top of the $20 movie ticket. No wonder then, that so many people are buying enormous televisions – which get cheaper and cheaper, bumping up their broadband download allowances and illegally downloading movies for the cost of a monthly internet connection. 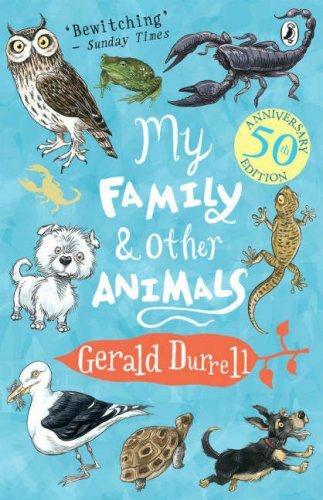 I had hardly thought of Gerald Durrell, the author and naturalist until my wife bought me his boyhood memoir “My family and other animals” as a gift. It tells the story of the four years he spent from 1935 to 1939 as a young boy living with his family on the Greek island of Corfu. The family left the dampness and cold of London for the fresh air, sunshine and open spaces of the Greek island at the behest of Lawrence Durrell – Gerald’s oldest brother, who himself would go on to be a famous novelist, essayist and travel writer. 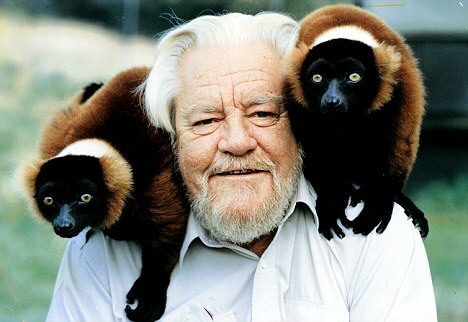 Picking up the book, I recalled a childhood memory of Gerald Durrell from a television show he presented that ran on South African television in the 1980s: a short, plump man with a white beard who appeared on television to tell us fascinating things about exotic animals. I looked at photos of him online and my memory served me well for he was indeed, short, plump and bearded. The book is a wonderful account of an idyllic childhood for a young boy fascinating with nature. It’s one of the most entertaining books I have read, full of wonderful anecdotes about Gerry (as the family called him) and the animals he collects and brings into the family home. These include: an owl, snakes (that end up being kept in the bath tub), frogs, a pigeon called Quasimodo, a tortoise and scorpions (that scatter one day across the floor during dinner) to name just a few. Gerry Durrell is part Steve Irwin – unafraid to pick up creatures to see them up close – but more so Sir David Attenborough, with a wonderful eye for the details of nature and how it works plus the skills of a gifted novelist to bring it all to life. He would sit on the window sill gulping to himself, until it got dark and a light was brought in; in the lamp’s golden gleam he seemed to change colour from ash-grey to a pale translucent pinky pearl that made his neat pattern of goose pimples stand out and made his skin look so fine that you felt it should be transparent so that you could see the viscera, coiled neatly as a butterfly’s proboscis, in his fat tummy. His eyes glowing with enthusiasm, he would waddle up the wall to his favourite spot, the left hand outside corner of the ceiling, and hang there upside down, waiting for his evening meal to appear. This wonderful gift for describing a scene and revealing the wondrous details and idiosyncracies of nature is found throughout the book. 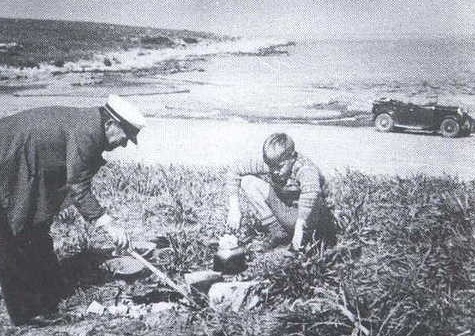 It is a mix of boy’s own adventure (Gerry accompanied by his faithful dog Roger exploring the island with almost unlimited freedom in which “all discoveries” filled him with “tremendous delight”) accompanied by hilarious tales of family life – Larry and his arty friends invading the island, his diet-obsessed sister Margo and the adventurous, gun-mad Leslie. The other wonderful aspect of the book are the lovable eccentric local characters: There’s Spiro, the Durrell’s taxi driver, “guide, mentor and friend” – a “short, barrel-shaped man” with a unique grasp of the English language and who adored the family, the tremendously fat and cheerful Agathi who taught Gerry peasant songs and the immaculately groomed, sparkly eyed, Dr. Theodore Stephanides, who became Gerry’s guide to the natural world plus a parade of doctors, housekeepers and tutors. Sitting on an old tin in the sun, eating grapes or pomegranates from her garden, I would sing with her and she would break off now and then to correct my pronunciation. We sang (verse by verse) the gay, rousing song of the river, Vangelio and how it dropped from the mountains, making the gardens rich, the fields fertile and the trees heavy with fruit. By the time I finished reading the book, I yearned for just a few days of Corfu sunshine and a walks among its hills, valleys, gently swaying Cypress trees and olive groves. I challenge you to find a more charming, magical account of a childhood we should only dream of giving to our children.